This is a perfect crochet cat coaster for cat lovers to decorate their home and once again, we’re here with one more beautiful and easy to follow free crochet pattern for these adorable coasters. I have been searching for a while for this kind of pattern and to my surprise, there are only a few free patterns for crochet cat coasters. However, I got lucky to find this fun project on ravelry a week ago. This pattern is easy for any crocheter to follow and it has endless possibilities. I personally modeled mine after my best friend’s cats, but the great thing about this pattern is that you can have these match any cats in your life, or you can create any kind of kitty cat your heart desires. The primary use for this pattern is a coaster, but you can also make a great wall decoration or a potholder. 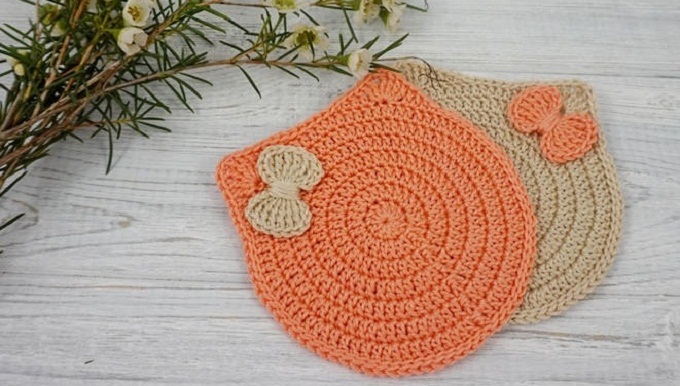 So, just download a free crochet pattern in PDF format by following the download link below and learn how to make these lovely cat coasters in the best possible way. These cat coasters are a fun way for cat lovers to decorate their home. The pattern includes: written description, crochet chart, crochet symbols and photo tutorial. Crochet Cat Coaster – Download a free crochet pattern here on ravelry or purchase a similar paid pattern here on etsy. Hope you’ll have a good time making these cute cat coasters. Good luck and happy crocheting.